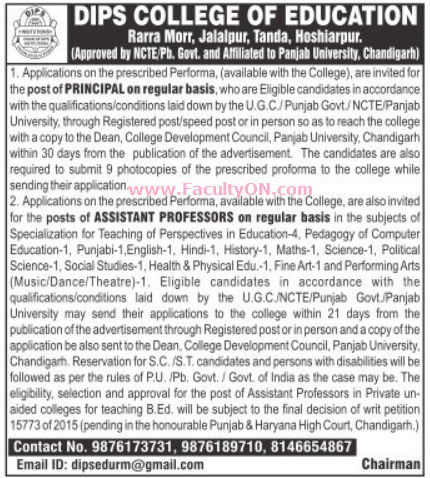 DIPS College of Education, Hoshiarpur has advertised in the TRIBUNE newspaper for recruitment of Teaching Faculty- Assistant Professor / Principal jobs vacancies. Interested and eligible job aspirants are requested to apply within 21 days from 30th May 2018. Check out further more details below. About College: The Chairman “CHAIN OF DIPS INSTITUTIONS” S. Gurbachan Singh was born on 10th March, 1946 in Distt. Layallpur, Pakistan. He had his basic education at Dhilwan. A man with humble beginning, had great dreams for the people of his native land. He wanted the same quality education which he himself was deprived of to rekindle and ignite the young minds of Dhilwan. It was with this mission and passion that he fulfilled his dream in the form of opening the first premier educational branch at Dhilwan. The sapling planted with dreams and aspiration of providing quality education soon grew into a full- fledged tree christened Chain of DIPS Institutions having its premier CBSE/PSEB affiliated schools and Degreee, Education and Management colleges. How to Apply: Interested and eligible candidates are requested to send CV with all copies of certificates / testimonials and recent PP size photos to the postal address mentioned below or submit application in person to the college.